The first generally available production racer was the 175 Sport of 1953 which morphed into the Sport Competizione in ’54. 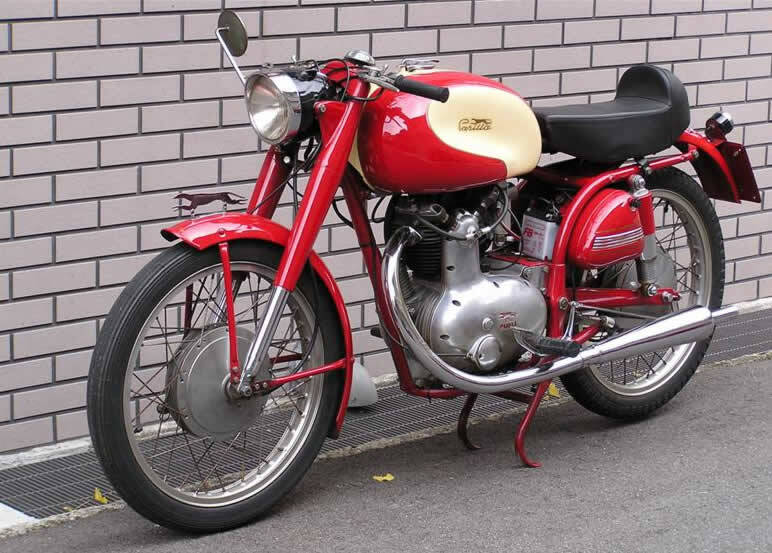 Also known as the “Bassotto” or “Sausage Dog” due to its long low slung appearance mostly brought about by the leading link forks & 16/17″ wheels. 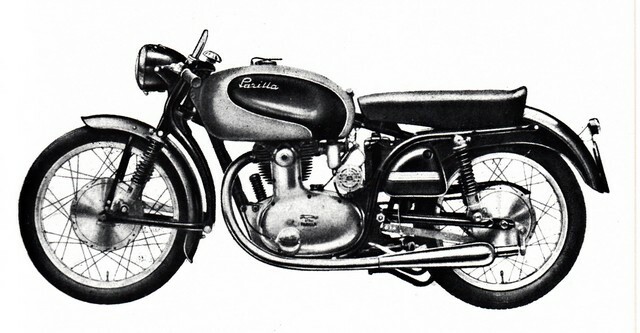 Made until 1956 by which time it was joined , confusingly, by another Sport model with Moto Parillas own version of a telescopic fork rather than the leading link version. Whilst the “Bassotto” was still on offer the first version of what we would recognise as the MSDS/GS came into being. The Sport used more conventional telescopic forks which were unusual in being what is now referred to as “upside down” or “USD”. The wheel spindle was fixed in the hub and entered into an open ended fork forgings which had stanchions brazed into them. These stanchions ran in hollow upper fork tubes which themselves were brazed into the top yoke. The fork was sprung internally but had no damping and was lubricated by grease on assembly. Not Moto Parillas finest design moment but effective when new.